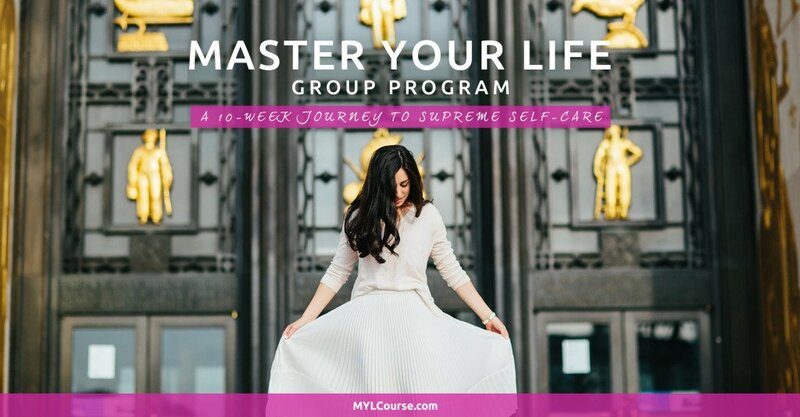 I am SO beyond excited to introduce you to the Master Your Life Course: A 10 Week Journey to Supreme Self Care. I’ve created this course to teach you, step-by-step, exactly what it looks like to truly take care of THE most important person in your life: YOU. Now, when I say self-care, I don’t just mean going to get manicures and drinking green juice. I mean diving deep and taking care of yourself from a mental, emotional, physical and soulful level. Mental Self-Care: How to make sure your mental game is in tip-top shape. Instead of walking around with constant thoughts about not being good enough, comparing yourself to others, or judging your every move, you’re going to learn how to have and maintain a healthy mindset – one filled with supportive, loving, confidence-boosting thoughts toward yourself and your life. Emotional Self-Care: How to deal with life’s ups and downs, and your own emotional ups and downs, in mature, refined, calm ways. We can’t control our lives – things happen that we don’t anticipate or don’t “want”, but it’s crucial that we know how to handle ourselves in any situation. As you do this, life feels easier, and you have the confidence in knowing that you can handle ANYTHING that comes your way. Physical Self-Care: How to take gorgeous care of your body. You only get one body, and it’s time to learn how to connect to and appreciate her. You and your body are worth taking impeccable care of, and I’m going to teach you how to start believing this yourself and then how to actually put it into action. Soulful / Spiritual Self-Care: You are about so much more than your body, your job, or your relationship. You have a soul that has a purpose in this lifetime, and if you aren’t tapping into that, you likely feel like something’s missing and you’re short changing yourself. The greatest joy in life comes from listening to YOUR own soul and following your inner guidance to know what you desire, need, and what lights you up. It’s time to start paying more attention to you. It’s time to finally love who you are. The world needs you: the full, real you. Click here for all the information about the Master Your Life Course. 3) Check out the “details” page that has the entire curriculum and all the goodies. If you’re in, go ahead and Enroll. It’s going to be incredible. I am bursting at the seams to guide you through this. I can’t wait to see you in there!